11/7/2008 2:08:09 PM Mountain Al:: 935, bingo! 11/7/2008 1:56:56 PM Mountain TG:: so 35 is stil in the cards. 11/7/2008 12:55:40 PM Mountain rrr:: Being a Friday after 3:00 could the woosh be carried to the close ? 11/7/2008 12:40:48 PM Mountain TG:: acetd "we go where it breaks". could you explain. 11/7/2008 12:16:54 PM Mountain TG:: 50% retrace of big drop of past few days is at about 952. 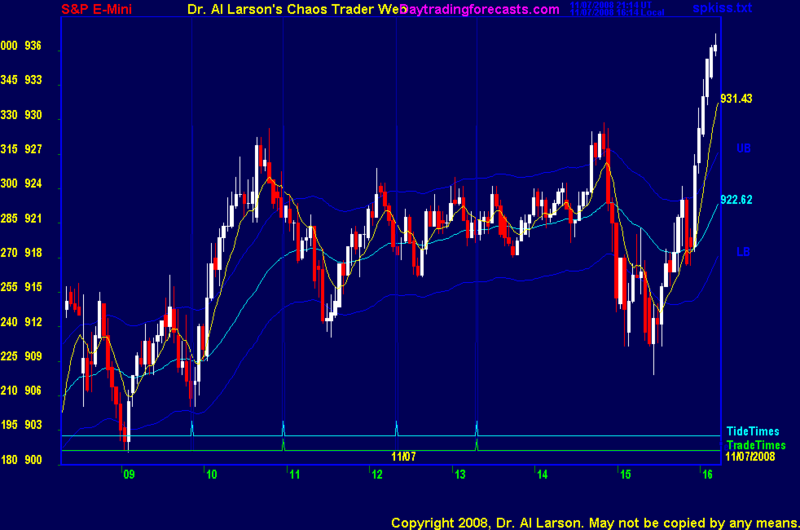 I have some CTME and FOP targets that say 944 to 954 is doable. Long from 20.75 since about 1:00. Wanted to tank the trade a few times but up trend was never compromised enough to do so. 11/7/2008 11:17:11 AM Mountain TG:: Al, when you mention a SA/SR time and price, it's an approximation correct? In other words, you don't really know the exact time and price until you see some decent price movement coming out of that time frame. 11/7/2008 10:58:49 AM Mountain TG:: Al, are you using a 9 pt cover on this one, thanks. 11/7/2008 10:50:48 AM Mountain bl:: Al, you said that 918 was an attractor and would repeal. Doesn't that mean it goes to that price and then sells off? Is that what you meant? 11/7/2008 10:12:19 AM Mountain rnt:: THanks, definitely a get on board move! 11/7/2008 10:11:03 AM Mountain Al:: whoosh meaning fast, not indicating direction-a "run for the xit"
11/7/2008 10:09:04 AM Mountain rnt:: Al, do you call a whoosh move, an UP move or DOWN move, or just a move in an undetermined direction? 11/7/2008 9:38:43 AM Mountain acetd:: following the red dotted line down now, what is the red dotted line Al?